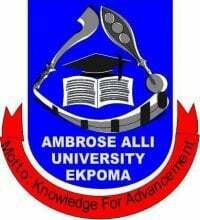 Ambrose Alli University, Ekpoma, AAU cut off marks for the 2018/2019 academic session admission exercise. If you scored exactly or above AAU cut off mark, that means you are likely to be considered for admission, and getting marks below cutoff means you may not be considered for admission. The management of the Ambrose Alli University (AAU) Ekpoma, has released the departmental cut-off mark for the 2018/2019 academic session admission exercise. AAU Departmental Cut Off Mark. Comment Text*How long does it take the result to be released? I got 63 in my screening will I get medicine. Pls guyz I got 49 in my screening points and I am studying banking and finance will I till be admitted into the school.. Comment Text*hi.. Pls I got 54 was hoping to study med lab. Will they still give me my second choice course microbiology?? Comment Text*pls, I have 66 as my screening point, do I stand a chance of getting admission to study medicine? Comment Text* how is the score calculated pls? please mr faponda help us to get update regard to post utme departmental cut off mark for 2018/2019 admission. Comment Text*My post utme score is 54 for Accounting. Any chance that i will be admitted. Have not seen my postutme score and have summited. * When do you register ? * Do you do change of course / institution ? * Check the o’level scratch card pin/ serial number you uploaded when register your Post utme form ?